Not to be confused with Purple Coin. A purple coin with a design unique to each kingdom. Used to buy outfits, stickers, and souvenirs specific to that kingdom. The regional coins of the Sand Kingdom. Regional coins are one of the main collectibles in Super Mario Odyssey and differ from regular coins that are used as a global currency instead. 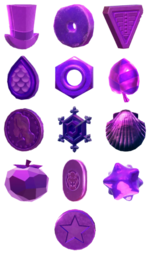 They are purple and their shape and design vary in each kingdom. They reappear in Super Smash Bros. Ultimate. Regional coins first appear in Super Mario Odyssey. They can only be used in their corresponding kingdoms to buy outfits, stickers and souvenirs in the Crazy Cap stores. There are 50 or 100 located in most kingdoms, and their shape and design vary in each kingdom. After being collected, they are replaced with clear replicas which are worth 2 regular coins. The Cloud Kingdom, Ruined Kingdom, Dark Side, and Darker Side do not have regional coins. When a regional coin is collected for the first time, it makes a sound that resembles the combination of gold coins and Star Bits. The Cap Kingdom has Hat-shaped regional coins, more specifically flat coins resembling top hats. The Cascade Kingdom has Stone Disks, likely inspired by rai stones, an old form of currency of the Yap Islands in Micronesia. The Sand Kingdom has Pyramid-shaped regional coins, whose overall design reflects the main landmark of Tostarena, the Inverted Pyramid. They were formerly named Pyramid Coins. The Lake Kingdom has Scale-shaped regional coins, representing the Lochladies. The Wooded Kingdom has Nut-shaped regional coins, matching the ironwork theme of Steam Gardens and the Steam Gardeners. The Lost Kingdom has Leaf-shaped regional coins, resembling the designs of Super Leaves. The Metro Kingdom has Portrait-stamped regional coins, which feature Mayor Pauline's portrait on one side, the city landscape on the other, and decorative stars on both, as well as a reeded edge. Before the game's release, they were referred to as City Coins. The Snow Kingdom has Snowflake-shaped regional coins. The Seaside Kingdom has Shell-shaped regional coins, designed after the shells of scallops, which are commonly associated with seashells. The Luncheon Kingdom has Tomato-shaped regional coins, whose crystal-like shape resembles the stylized produce of Mount Volbono. Bowser's Kingdom has Oblong regional coins, kobans with Bowser's insignia on them. The Moon Kingdom has Star Bit-shaped regional coins, which are based on the Star Bits found in Super Mario Galaxy and Super Mario Galaxy 2. The Mushroom Kingdom has 64-esque regional coins, whose star stamp design is similar to the coins found in Super Mario 64, coincidentally resembling Purple Coins from the Super Mario Galaxy games. Regional coins reappear in Super Smash Bros. Ultimate where the regional coins from the Metro Kingdom, as well as the aforementioned sound effect heard when a new regional coin is collected, can occasionally be seen during Mario's Super Jump Punch in place of regular coins from Super Mario 64 or Star Coins from the New Super Mario Bros. series of games. ↑ Official Japanese Mario Odyssey Twitter. Retrieved September 18, 2017. This page was last edited on March 22, 2019, at 20:17.